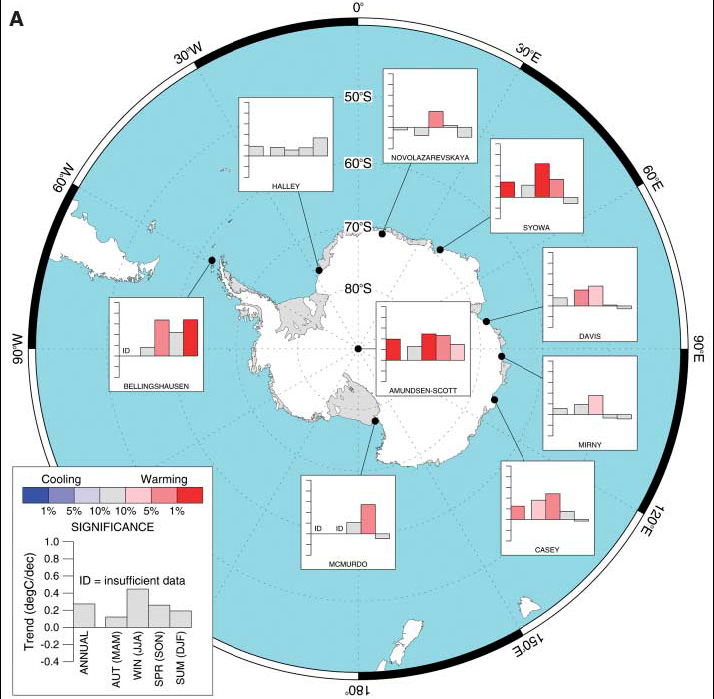 The “iconic” Antarctic temperature trends are the large warming seen on the Antarctic Peninsula, which has had various repercussions including the collapse of several ice shelves (some documented in a previous post). Elsewhere, though, the pattern of surface warming is more complex – trends are smaller, and while more are positive than negative they are generally not significant – see this map. Contrary to what you might have heard, this is in general agreement with model predictions. But meanwhile, there is a record for the upper atmosphere derived from radiosondes, which we have been working on – finding old datasets and digitising them to fill in gaps. What this shows is that around East Antarctica there is a general warming of the troposphere, greatest at around mid-height (at 600 hPa) at 0.7 ºC/decade over the last 30+ years. In itself, this is an interesting observation. The obvious question is, what does it mean? Is this natural variability; is it a response to global warming, or to changes in ozone; or something else? Ozone is unlikely, because this is winter (which conveniently means that the radiosonde temperature corrections, often a source of potential trouble, are not a problem). Two ways of trying to interpret the record are to see what GCMs run for the same period show; or to look at the re-analyses (essentially, the archived outputs from the weather-prediction models). The latter, of course, incorporate many of the radiosonde observations that we are using, and so don’t count as independant. Despite this, the ECMWF re-analyses show *greater* trends than we see in the observations; and a maximum trend over West Antarctica (which has no radisonde stations to allow us to verify this). A climate model (HadCM3, with an ensemble of four members) shows similar patterns to the observations, but this time too little warming; and a good deal of variation between the ensemble members. So neither of these is helps much with the interpretation. So we are currently left with an open question; hopefully, this will stimulate us and other researchers to explain it in the future. In a recent paper in Geophysical Research Letters, Scafetta & West (S&W) estimate that as much as 25-35% of the global warming in the 1980-2000 period can be attributed changes in the solar output. They used some crude estimates of ‘climate sensitivity’ and estimates of Total Solar Irradiance (TSI) to calculate temperature signal (in form of anomalies). They also argue that their estimate, which is based on statistical models only, has a major advantage over physically based considerations (theoretical models), because the latter would require a perfect knowledge about the underlying physical and chemical mechanisms. What is one to make of a recent press release and submitted preprint blaming global warming on the Tunguska meteor event in 1908? Well, although it is not unknown for impact events to affect climate (the K/T boundary event springs to mind) there are a number of hurdles for any such theory to overcome before it moves into the mainstream from the wilder shores of unsubstantiated speculation. As anecdotal evidence of past climate change goes, some of the most pleasant to contemplate involve paintings of supposedly typical events that involve the weather. Given the flourishing of secular themes in European art from the Renaissance on, most of this art comes from the 16th to 19th centuries. As readers here will know, this coincides (in the public mind at least) with the so-called ‘Little Ice Age’ and somewhat inevitably this canon of work has been combed over with a fine tooth comb for evidence of particularly cold conditions.